Dive into the largely uncharted waters of revision hindfoot arthrodesis. Expert faculty will review methods used to assess residual deformity, from gait assessment, static radiographs to weight bearing CT technology. Learn operative techniques available to perform revision hindfoot arthrodesis, with consideration on surgical approaches to minimize complications. Should those complications occur, such as infection, incisional wound necrosis, and avascular necrosis, the faculty will explore methods to assess and manage these conditions. The webinar concludes with case studies illustrating the above-mentioned methods. Assess the magnitude and location of residual deformity through gait studies and weight bearing CT scans. Prevent, assess, and manage the complications of revision hindfoot surgery. Detail the steps needed to technically perform a revision hindfoot surgery. AOFAS is accredited by the Accreditation Council for Continuing Medical Education (ACCME) to provide continuing medical education for physicians. AOFAS designates this Live Activity for a maximum of up to 1 AMA PRA Category 1 Credit™. 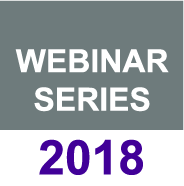 The 2018 webinars are provided free to AOFAS members and orthopaedic residents/fellows with funding from the Orthopaedic Foot & Ankle Foundation, supported in part by grants from Arthrex, Inc., and Wright Medical Technology, Inc.